After dominating the burger industry for years, fast food behemoth McDonalds now finds itself under pressure. Falling sales and negative customer opinion of the brand has characterised the last 12 months. I can use YouGov BrandIndex data to explore the problems the company faces in the year ahead. Whereas in the past, other fast food retailers such as Burger King would act as rivals to McDonalds, the emergence of higher-end restaurants such as Byron Burger, Honest Burger and Gourmet Burger Kitchen have provided a new threat to McDonalds in the UK specifically, with similar trends emerging worldwide. Restaurants such as those above are very much en vogue, and offer a profoundly different experience to that found in a fast food environment, which appeals to Britain’s middle-classes – the main target audience. Customers are also being attracted by the promise of increased quality. Well sourced ingredients and the opportunity to personalise their orders are particularly popular features. Consumers may also be concerned about the health effects and salt content in McDonalds’ products due to things they have read or heard. YouGov’s Index rating indicates the preoccupations customers have with McDonalds. The metric takes in to account factors such as quality, impression, value and satisfaction. Since the beginning of September the Index score has been resolutely negative, showing an average of -15.4. An area McDonalds will obviously be looking to aid the arresting of their sales decline is in their marketing efforts. This week, in the US, the company is launching what it describes as a ‘brand transformation’, which will be underlined by the phrase “Chose Lovin’”. YouGov’s Ad Awareness metric indicates that the brand has a consistently high level of cut through with the public, averaging a strong score of +32.7 since September. When this revamp goes global, its effect will be crucial for in the attempt to regain an authoritative place in all aspects of the market. Other measures such as menu simplification and a greater push towards customisation have been decided upon, principally in the U.S. How this impacts upon consumers remains to be seen. 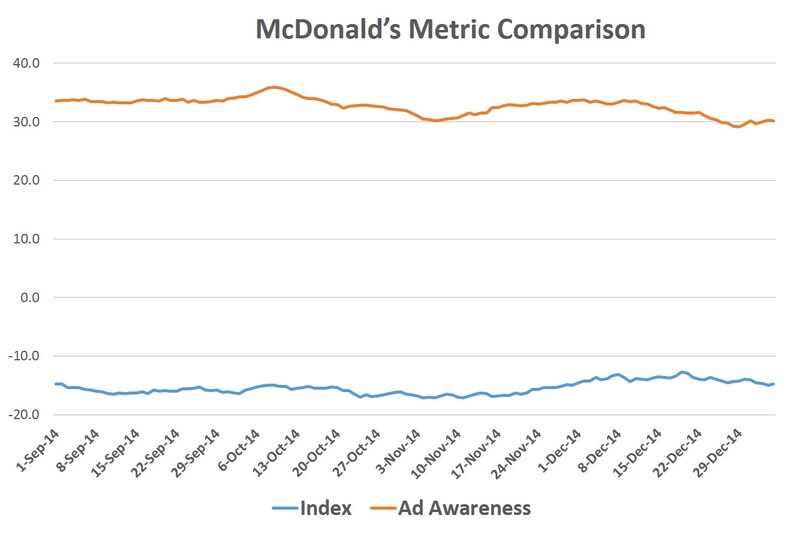 Whether those who now seek a healthier option can be convinced to return will be essential to McDonalds’ future profitability.